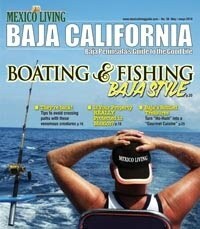 As you head off to Baja with dreams of reeling in those tall tales, be aware of Baja’s sportfishing permit requirements. Fishing licenses for "every person" on board—even if they’re unable to throw a line and regardless of age (but unnecessary if fishing from land). Only one hook or line per person on board, although unlimited placements. Only 4 hooks to every vertical line while fishing for bottom fish. Electric reels are restricted to disabled fishermen, and only after written authorization from the Ministry beforehand. Bagging limits for fin fish (no shellfish, mollusks, crustaceans, totuava, turtles or marine animals) are: 10 daily from ocean waters and estuaries (a shark is equivalent to half the day’s allowed catch); 5 daily from inland waters (rivers, lakes, dams). Bag limit for boats at sea for three days is three times the limit for one day. “Catch and release” over the bag limit is encouraged to return fish to their environment in good survival condition. Capturing fish for ornamental purposes. Dumping trash or toxic substances that harm aquatic flora or fauna. Fishing within 250 meters of swimmers. Using artificial lighting to attract schools of fish. Filleted fish aboard the vessel. HANDY TIP: Fisherman’s Landing sells Mexican fishing licenses and boat permits, and is open daily. It also has a great tackle selection and friendly staff. So, let a glorious fishing trip in Baja waters turn into a whale of time for you, your family and friends—by following the simple rules listed above. Winter: 7 a.m.–6 p.m.; Summer: 7 a.m.–1 p.m. If you have a fishing, cruising or fun-loving boat you’ve been hauling around to inland lakes and dams, you’ll love taking it to the Sea of Cortez. Baja California is one of the most idyllic aquatic nirvana experiences ever. You’ll enjoy the thrill of sporting with diving dolphins, sea lions and flying fish. The Sea of Cortez is a marine jewel just waiting to be explored and enjoyed, time and again. Many are also unaware how easy it is to set sail to Baja California—by road. Just hitch your floating friend to your SUV or truck. Drive it across the border and down to the Sea of Cortez. Here’s how and what you’ll need to do. With a red light, you may have to pull over; remove the boat’s cover; show both boat registration and trailer title. Picturesque towns such as La Paz, Puerto Escondido, San Felipe and Santa Rosalia have marinas on the Sea of Cortez. Complete with slips, water, power, showers, fuel docks and boat launch. Along the Pacific Ocean, Rosarito Beach, Ensenada and Cabo San Lucas also have marinas. 1. Cross the Sea of Cortez from San Felipe to Puerto Peñasco; either direction is 73 nautical miles. There are full-service marinas in both ports. A cruiser or sailboat takes 6–8 hours; a speedboat and flat seas, 2–3 hours. 2. From San Felipe, head south to explore the Sea of Cortez. 4. San Felipe to La Paz is a beautiful long sea journey through Bahia De Los Angeles, Santa Rosalia, Mulegé and Loreto. 5. If coasting down the Baja passage, leave from Ensenada or Rosarito Beach to glitzy Cabo San Lucas. How long have you owned the boat? Did you sleep on the boat? Where did you go in the boat?